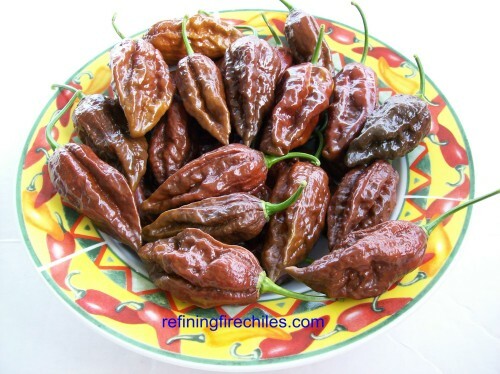 The Chocolate Bhut Jolokia is a natural variant of the Bhut Jolokia. It became available to the public in 2008 through Frontal Agritech Assam, India. It has the heat level of a Red Bhut Jolokia but also has a sweet undertone. One of the most delicious Superhot chiles I have ever tasted. This species does not germinate as easy as the normal Bhut Jolokia and can take up to 6 weeks. So if your a novice grower better to try something else. If you grow in a heated seed try grow by itself because other seeds will sprout first and then you will be removing clear humidity cover before your Chocolate Bhut Jolokia sprouts.